Last week was jam-packed with plenty of Fog City Journal’s favorite things, or what I like to call the 3 B’s: birthdays, babies, and beer. Not only did our very own h. brown turn 64, but Board of Education President and District 9 supervisor candidate Mark Sanchez also celebrated a birthday (more on Mark later). h. had a great time at his birthday party, and didn’t insult anyone. I felt kind of cheated. 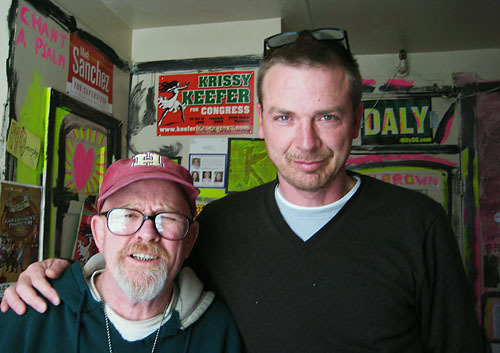 h. brown and Luke Thomas. 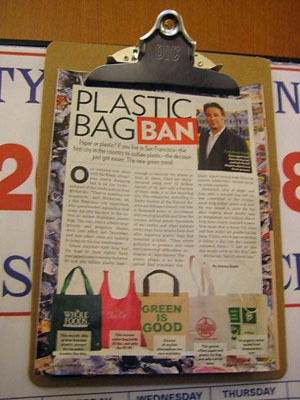 Supervisor Ross Mirkarimi appears in the latest issue of People magazine. Mirkarimi had the page posted in his office during his monthly art opening on Friday, but I didn’t bother reading it (I’m an Us Weekly girl). But when a friend told me the article “sounded like a personal ad,” I knew I had to get a copy. Mirkarimi, who is single and lives with a rescued dog and cat, was committed to the environment long before green was cool. Supervisor Ross Mirkarimi in the latest issue of People magazine. 1. 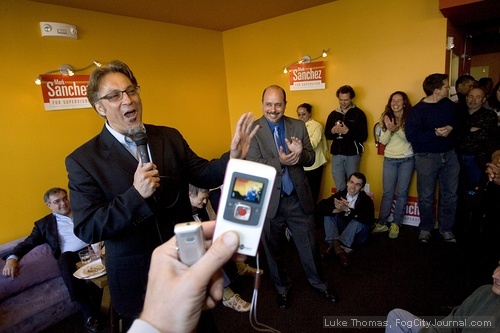 Mirkarimi was born in Chicago on the exact same day as Sen. Barack Obama. 2. His uncle, whom Mikrarimi has never met, was a famous wrestler who represented Iran in the Olympics. 3. He won’t be attending the Green Party National Convention in Chicago this summer because he’s endorsed Obama. 4. He gets a lot of parking tickets. But he doesn’t get a pass! 6. He only gets about 4 hours of sleep a night. He falls asleep easily, but has difficulty staying asleep. This makes him cranky sometimes. 7. He drinks a lot of water. 8. Like most Persians, he loves pomegranates. 10. He’s running for mayor in 2011 and regrets not running a name-recognition mayoral campaign in 2007 (according to Thomas). There’s also a plug for ChicoBag in the article, which is my cue to tell everyone that I am a proud owner of two ChicoBags. Not only are they good for the environment and extremely portable, but it’s much easier to carry a Chico bag than a plastic bag because the flimsy handles on plastic bags cut off the circulation in my fingers, not to mention plastic bags are considered an environmental disaster. My other complaints: Plastic bags don’t come in multiple colors, and are too transparent. I don’t want creeps knowing what I just bought at Walgreens. For more videos from the art party, check out Fog City Journal’s YouTube channel. 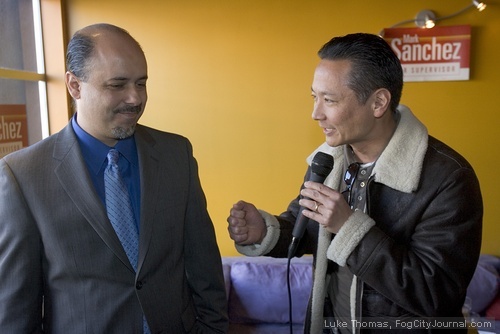 Fog City Journal attended the campaign kick-off party for Board of Education President and D9 Supervisor candidate Mark Sanchez Sunday in the Mission. Luke Thomas and I chatted with legal eagle and D11 Supervisor candidate Randy Knox. Randy introduced us to Christian Cooper, who’s originally from Laguna Beach, CA. Of course, Christian immediately told me how much he hated the MTV reality show. I’ve been waiting for the perfect time to write: “I haven’t been this devastated since MTV canceled Laguna Beach, and that was a sad day for humanity.” And now I finally have an excuse. Thank you, Christian! But nothing in SF politics will ever sadden me as much as the cancellation of Laguna Beach. Seriously. I’m still not over it. and Community College Board candidate Bruce Wolfe. Board of Education member Kim-Shree Maufas and Randy Knox. The event featured several speakers including Public Defender Jeff Adachi, Board of Education Member Jane Kim, Planning Commission President Christina Olague, and Supervisor Ross Mirkarimi. Adachi joked about what Sanchez would have to change about himself in order to run for supervisor, including wearing a suit (check), taking pretty pictures (check), and cutting his hair (not yet). “They can change a lot of things about Mark, but what you can’t change about this man is his integrity and his honesty,” Adachi said. Mark Sanchez and Public Defender Jeff Adachi. 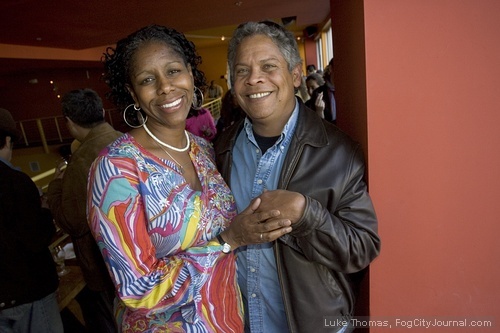 Kim described Sanchez as an elected official with a history of community organizing and a strong Progressive record during his 8 years on the Board of Education. and Planning Commission President Christina Olague. Olague encouraged supporters to vote for Sanchez because he’s the best choice out of the three candidates in the race, she said. Olague also stressed the importance of maintaining a progressive majority on the Board of Supervisors. 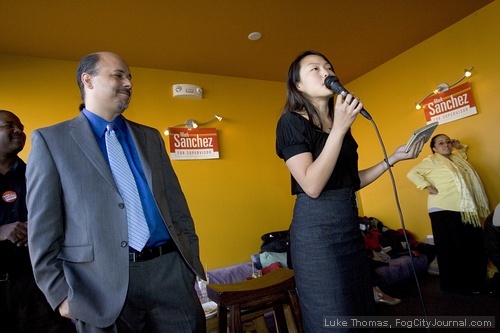 “And it’s not to diss the other candidates, but we know at the end of the day, we as Greens and as progressives in San Francisco can count on Mark to lead this District and through all of it’s challenges, and there are many,” Olague said. 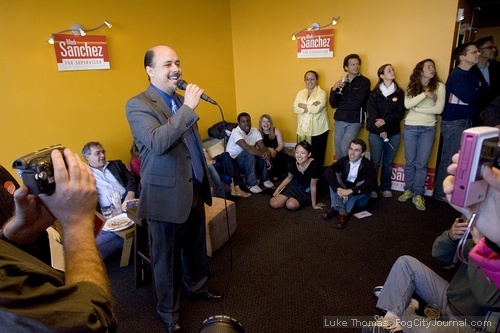 Sanchez himself addressed the crowd, taking special time to thank his mom, who came in from Southern California for the event and will be staying in Bernal Heights to help out with the campaign. Sanchez pointed out members of the audience who are also running for office in November: fellow Board of Education member Eric Mar, who’s running for District 1 Supervisor, Community College Board candidates Bruce Wolfe and Chris Jackson, and former Youth Commissioner Peter Lauterborn, who’s running for school board. District 9 Supervisor candidate Mark Sanchez. I think I did actually catch someone calling Eric, Mark. Sanchez spoke passionately about his experience as an educator and the tragedy of losing three of his former students to violence over the past year. 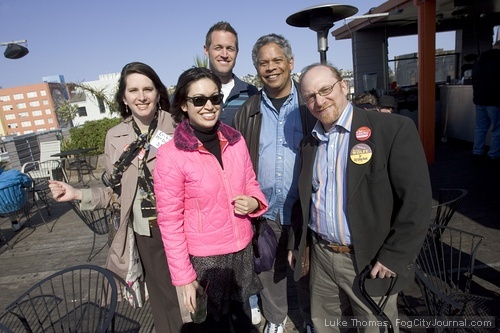 District 5 Supervisor Ross Mirkarimi, who is up for re-election in November, emphasized the importance of grassroots campaigning. 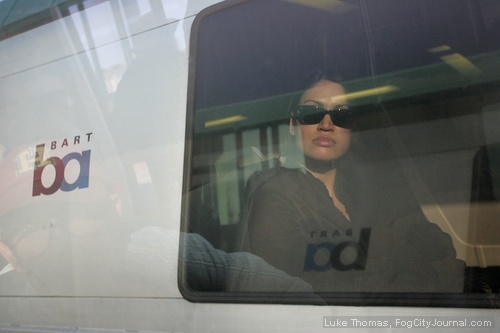 “You’re going to have to bust serious hump, you really are,” Mirkarimi said. Supervisor Ross Mirkarimi and Mark Sanchez. “People talk a good game about grassroots campaigning, but nothing ever compensates for the shoe leather that goes door to door, and that’s what it’s going to have to take to put this man in office,” Mirkarimi said. 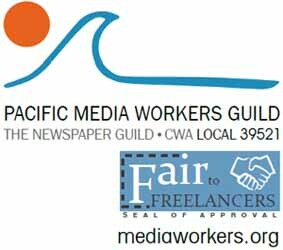 More videos on FCJ’s YouTube channel, including speeches by Jeff Adachi, Jane Kim, Christina Olague, and Ross Mirkarimi. Comments for The CrackBerry Chronicles: A lighter shade of Green are now closed. Great column, as always! Amy is happy with her Crackberry/Youtube debut! ross is a good guy. he has been a good advocate for D5, and has really listened to people when it comes to MUNI issues.